We investigate the use of an autonomous underwater robot for inspection of hulls and harbor infrastructure. Applications include safety inspection to monitor paint and corrosion, and security inspection to search for limpet mines. Use of the robot avoids putting divers at risk and ensures full coverage even in turbid waters. A major challenge is underwater navigation, because GPS is not available and state estimates from onboard navigation sensors drift over time. The solution is to use imaging or profiling sonar, and, if water turbidity allows, cameras, to map the environment, while using this map for localization. In robotics, this chicken-and-egg problem is commonly refered to as simultaneous localization and mapping (SLAM). We use a Bluefin Hovering Autonomous Underwater Robot (HAUV) with a fiber tether to facilitate real-time data visualization and development/debugging. Navigational sensors include a ring laser gyro and a Doppler velocity log (DVL). For perception, we use an actuated DIDSON sonar, or alternatively a prototype of an electronically steerable 3D forward looking sonar. Two cameras and a light source are also available. 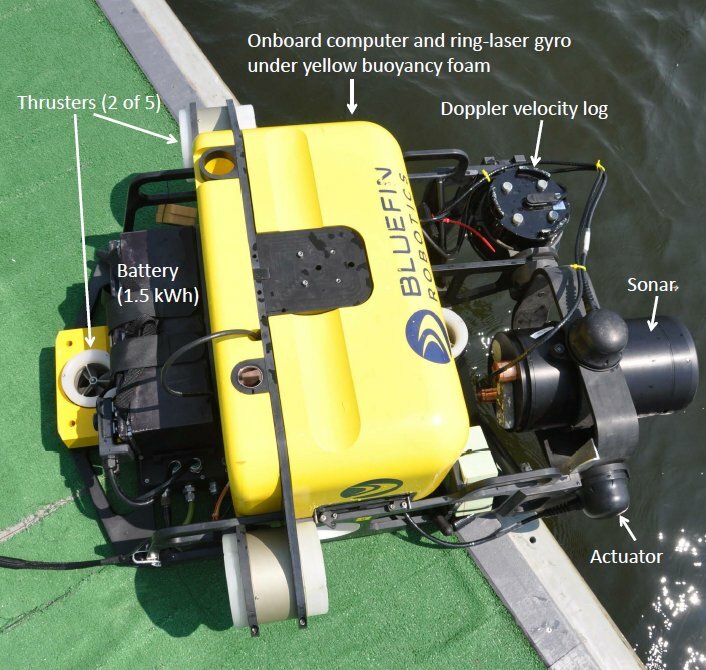 The Bluefin Hovering Autonomous Underwater Vehicle (HAUV). 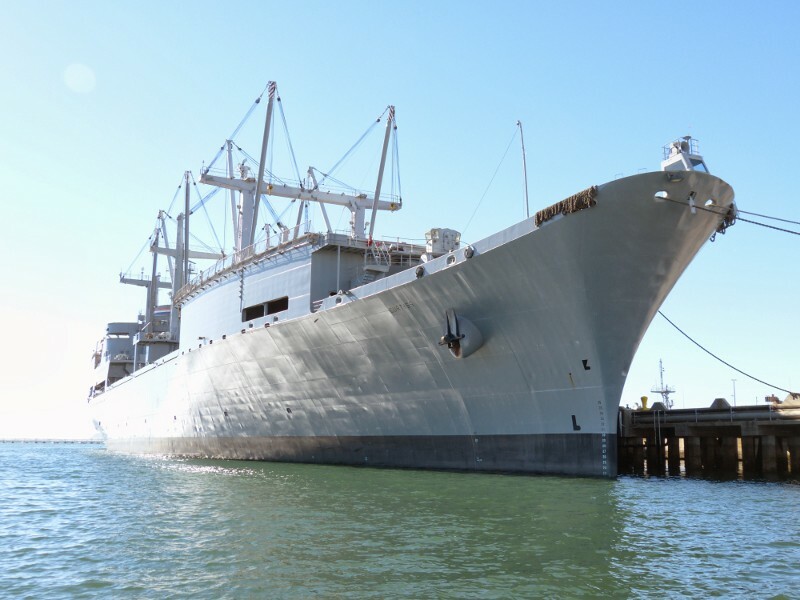 We regularly test our latest work on large ships, ranging from Coast Guard cutters all the way to aircraft carriers. One of the ships used for testing, the SS Curtiss in San Diego, CA. Please direct questions about this work to Michael Kaess. This work is sponsored by the Office of Naval Research under grants N00014-12-1-0093 and N00014-16-1-2103, and by the American Bureau of Shipping. "Towards Acoustic Structure from Motion for Imaging Sonar" by T.A. Huang and M. Kaess. In IEEE/RSJ Intl. Conf. on Intelligent Robots and Systems, IROS, Hamburg, Germany, Sep. 2015, pp. 758-765. Details. Download: PDF. "Generic Factor-Based Node Removal: Enabling Long-Term SLAM" by N. Carlevaris-Bianco, M. Kaess, R.M. Eustice. IEEE Trans. on Robotics, TRO, vol. 30, no. 6, Dec. 2014, pp. 1371-1385. Details. Download: PDF. "Mapping 3D Underwater Environments with Smoothed Submaps" by M. Van Middlesworth, M. Kaess, F.S. Hover, and J.J. Leonard. In Conf. on Field and Service Robotics, FSR, (Brisbane, Australia), Dec. 2013. Details. Download: PDF. "Advanced Perception, Navigation and Planning for Autonomous In-Water Ship Hull Inspection" by F.S. Hover, R.M. Eustice, A. Kim, B.J. Englot, H. Johannsson, M. Kaess, and J.J. Leonard. Intl. J. of Robotics Research, IJRR, vol. 31, no. 12, Oct. 2012, pp. 1445-1464. Details. Download: PDF. "iSAM2: Incremental Smoothing and Mapping Using the Bayes Tree" by M. Kaess, H. Johannsson, R. Roberts, V. Ila, J.J. Leonard, and F. Dellaert. Intl. J. of Robotics Research, IJRR, vol. 31, no. 2, Feb. 2012, pp. 217-236. Details. Download: PDF. "Efficient AUV Navigation Fusing Acoustic Ranging and Side-scan Sonar" by M.F. Fallon, M. Kaess, H. Johannsson, and J.J. Leonard. In IEEE Intl. Conf. on Robotics and Automation, ICRA, (Shanghai, China), May 2011, pp. 2398-2405. Best automation paper finalist (one of five). Details. Download: PDF. "Imaging Sonar-Aided Navigation for Autonomous Underwater Harbor Surveillance" by H. Johannsson, M. Kaess, B.J. Englot, F.S. Hover, and J.J. Leonard, IEEE/RSJ Intl. Conf. on Intelligent Robots and Systems, IROS, (Taipei, Taiwan), Oct. 2010. Details. Download: PDF. "Towards Autonomous Ship Hull Inspection using the Bluefin HAUV" by M. Kaess, H. Johannsson, B. Englot, F.S. Hover, and J.J. Leonard. Ninth International Symposium on Technology and the Mine Problem, (Naval Postgraduate School, Monterey, CA), May 2010. Details. Download: PDF.